In your largest mixing bowl, blend Flour, Almond Flour, Salt, Cocoa Powder, Baking Soda and Baking Powder with a whisk. In another bowl, blend Margarine, Sugar and Applesauce with an electric hand held mixer until your ingredients are creamy. Then move your Margarine mix to your bowl with the Flour mix and blend until smooth. Then gradually mix in your Soy Milk, Vanilla and Almond Extract until your batter is completely blended and smooth. Spray down your whoopie pie pan with Baking Spray. You can see what those look like here. Fill your frosting gun or pastry bag with your batter and if you are using a whoopie pie pan gently fill the cups 3/4 of the way. The cookies are going to expand while baking so make sure your cups are evenly filled. Bake for 8 to 10 minutes or until they are golden brown. They are soft cookies so you don't want them too crispy and don't be surprised if they rise A LOT. Let them cool on a wire rack with the bottom side down so you don't mess up the pretty side. Fill your frosting gun with the Strawberry Jam and use your largest tip. Once your cookies are completely cool to the touch, put no more than a tablespoon of Strawberry Jam in the very center of one cookie and then using another cookie around the same size and shape to finish your sandwich by placing it on top. Gently squeeze so that some of the Jam peaks out but be careful - the jam is much softer than even regualr whoopie pie frosting. So be careful and only slightly press. 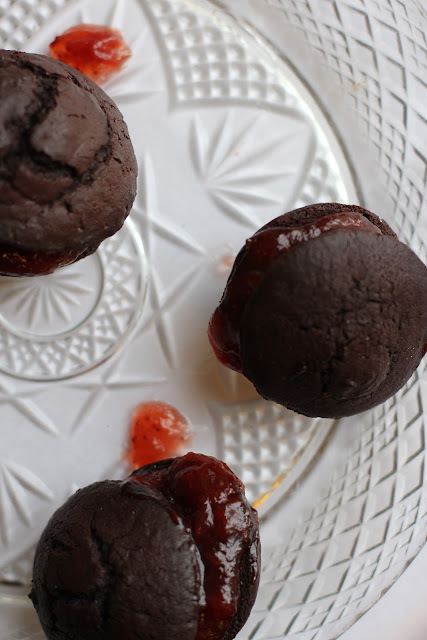 Be prepared for these whoopie pies to a little sticky when you eat them... I recommend pulling them apart like an oreo and eating one side at a time... with a loved one and maybe some of that vanilla soy milk we used earlier. 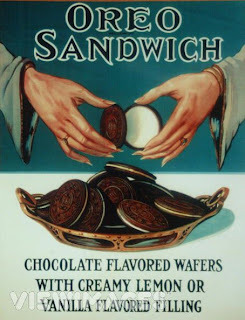 Having never had a Whoopie Pie (we have something similar called Melting Moments - but they are shortbready) I have to say these sound devine. I'm keen to know, about how many sandwiched biscuits does a batch make? Need these in my life like NOW. Do you think gluten-free all purp flour would work? Ahhhh I love chocolate and strawberries so much!! So excited to try these pups out! And anything I can eat like an oreo is beyond amazing in my book :) Thanks for the great recipe! Great questions - Sorry I didn't mention it above. Using a whoopie pie pan - this made a little over 2 dozen cookie sandwiches (so 4 dozen cookies total). I'm pretty sure GF flour should work. I know with like GF pancakes and Bisquick - GF can be a bit heavier and chewier. So maybe add less almond flour. I added that to make it chewier. I've struggled with strawberry frosting in the past but now I know the trick, I can't wait to whip up a batch! Thanks so much. This looks so delicious...I've seen so many whoopee pie recipes but never one with a strawberry filling. I need to make these.